​and create memories that will last for years to come. ​in popular varieties including Balsam Fir, Blue Spruce, Fraser Fir, Cork Bark Fir, and Norway Spruce. With so many to choose from, maybe you’ll find a new favorite this Christmas season. Got a well-behaved dog at home? 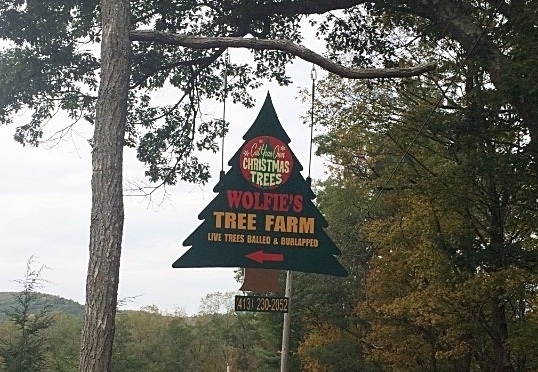 Bring ‘em along—we love pets at Wolfie’s Tree Farm! Choose and cut your own tree or we will be glad to cut it for you. To make your Christmas tree easier to handle and haul home, we offer FREE netting and baling. We offer a large selection of balled-and-burlapped evergreen and deciduous trees for home landscaping and transplanting. Need a larger tree? We are fully equipped to transport and transplant large trees to beautify your home’s landscaping. So many varieties…so many beautiful trees to choose from! For the holidays, we offer Balsam Fir, Blue Spruce, Fraser Fir, Cork Bark Fir and Norway Spruce Christmas trees. You’ll also find field-grown trees, evergreens, and deciduous trees for your home landscaping that we can professionally transplant for you in the spring or fall.